Hey hockey gods, some help? Let's get one with under ten seconds left. Can;t say it's been a good one, but we brought it down to the wire. 1-1 without Gio, 3 in 4 nights(2 wins) and a game they easily could have had with a bounce or two. 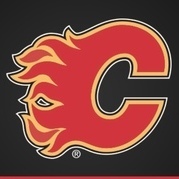 This is not a good game by Flames. They looks tired and slow tonight. Too bad our goal was called back. 2nd game of a back to back. Missing our top defenseman and one of the top defensemen in the league. Missing our top shut down center. And yet the Oilers still barely beat us, even with the refs in their back pockets. I am not too worried about this one, or the Oilers in general. B2B & no Gio killed us! To me, it looked like the Flames were making passes that Edmonton got their sticks on a lot. So not enough passes were getting through. There was a lot of skating into groups of Oilers as well. Being tired could have caused a lot of poor decision making. The called-back goal deflated them for a bit as the momentum shifted and it killed some of the time on the clock. A game where there weren't many chances. A couple of pucks dribbled in through the crease. Nothng to hang your head in shame about. We got the important win in regulation. Burn the tape and move on. The game should give BP some indication of who the top players are and who the guys underperforming are. What did we have 5 penalties? ANd they managed to score on a lucky breakdown wth an open net. Sure wasn't the fabled BoA tonight! The announcers should just shut it! I feel like the loss of Backs is starting to show. The 2nd line is off. When the first line isn't going, it can be scary. The 2nd line has been quiet for a long time now. Tkachuk is mostly invisible with Bennett up there. Not dumping on Bennett, but he kills offense. Okay, so that sounds like dumping. The 3M line with Bennett hasn;t looked good since November. Ryan and Bennett do not mesh. Tkachuk and Ryan do not mesh. Tkachuk's is best with players he can pass to or get passes from. Would be dynamite with Monahan and Lindholm or just one of them. Would probably fit with Neal or Mangiapane or Janko. I am souring on Bennett actually, and I've been one of his biggest backers this whole time. I just don't think it's going to happen with the Flames for him. I agree. I'd hate to break up one of the top lines in the NHL, but to get/keep Tkachuk going, they may have to drop Lindholm to his line. If they can find someone to play with Guadurea and Monahan, in the long run, it'll be better. I have a feeling Backlund has been injured for most of the season so far. Perhaps the concussion is not really a blessing in disguise, but something along those lines. I dunno. He's been good defensively, but off on the other end of the rink. I thought Quine had another strong game. If he can keep it up, I think we should keep him up here. We fought the puck all night, bad passes and not being able to catch passes etc. That was the least dangerous 60 minutes mcdavid has ever played against us. With gio and backs, (and not playing on b2b) I have full confidence we take them out early in the playoffs. Disallowed goal was the right call, peluso definitely prevented his glove from getting over. The biggest problem I have with that call, is there's no way it would have been waived off if the teams were reversed.